As Dr. Christine Blasey Ford testified before the Senate Judiciary Committee Thursday and Judge Brett Kavanaugh prepared to defend his reputation, America was following the high-stakes Washington drama with rapt attention. Traders on the floor of the New York Stock Exchange watched the testimony on big screen televisions above the trading floor. So did patrons of watering holes across the land. Some even livestreamed the hearing on the subway. On many college campuses, televisions were set up in cafeterias and other gathering places so students could watch history unfold. It was hard to find an empty seat in the atrium of the Rutgers Law School in Newark, New Jersey. 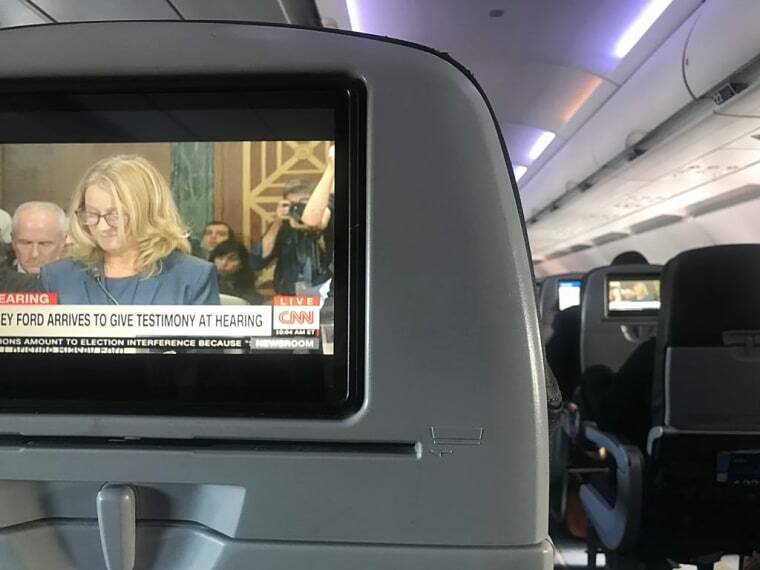 And high in the Friendly Skies, many travelers tuned-in to watch the questioning of Ford about an assault — allegedly at the hands of a then-17-year-old Kavanaugh more than three decades ago. President Donald Trump, who has emerged as one of Kavanaugh’s strongest supporters, also tuned in to watch Ford’s testimony when he returned to the White House, an official there confirmed. Even before Ford was sworn in, there was clear and measurable evidence that the public was eager to hear the California professor, whose sexual assault claim has put Kavanaugh’s nomination to the Supreme Court in jeopardy. At one point, all 10 of the top trending terms of Twitter were a rotating set of words related to the hearing, company communications manager Nick Pacilio told NBC News. Google showed a similar spike in interest, with 24 of the top 25 real-time search trends related to the hearing.